Surajgarh Fort was established in the year 1780 by Thakur Suraj Mal. The construction of the fort not only offered employment to the people from the neighboring villages, but after its completion also offered a safe sanctuary from marauding bandits and invading armies. The fresscoes for which Surajgarh are famous owe their existence to the many travelers who came through this region. The materials were Crushed cowrie shells, lime and vegetable dyes, which were produced locally were used for painting the frescoes. The cowrie shells were used as currency at one time, but since the chipped and broken shells had no value, they were crushed to produce a water resistant base for the frescoes. Surajgarh town has got it’s name from 18th century Surajgarh Fort which was built by Thakur Suraj Mal in 1780. For the construction of the fort not only offered employment to the people from the neighboring villages, but after its completion also offered a safe sanctuary from marauding bandits and invading armies. Presently the Fort is converted into a Heritage Hotel and is owned by the son of Princess of Jodhpur and Maharaja of Kangra, Tikaraj Aishwarya Katoch and his wife Tikarani Shailija. Tikarani Shailija is the eldest daughter of the Maharaja of Sailana, famed for India&rsquo;s finest cuisine. The Surajgarh fort, one of the major tourist attraction of Surajgarh is Managed and Operated by Mr. Upendar Singh Rathore, Director of Rajasthan Desert Safari Pvt Ltd., Jaisalmer. 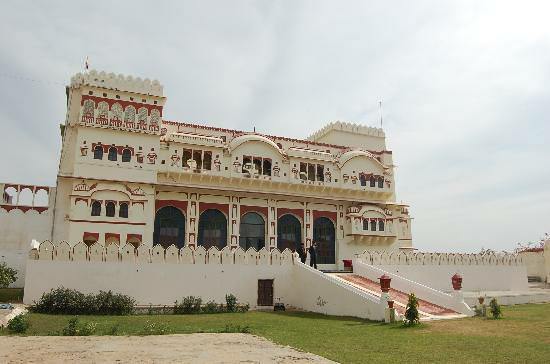 By Road: Surajgarh Fort is located at the centre of Surajgarh city near post office. One can easily reach here by hiring local taxi, rickshaw or by walk. By Rail: Surajgarh Fort is well connected through nearest Surajgarh (1.5 km) railway station to major cities railway stations like Delhi, Agra, Mumbai, Chennai, Ajmer, Pali, Jaipur, Ahmedabad. By Air: Surajgarh Fort can be reach through nearest Jaipur Airport (214 Km) and IGI Airport Delhi (181 Km) which is well connected with regular domestic flights to Delhi, Mumbai and other international flights.